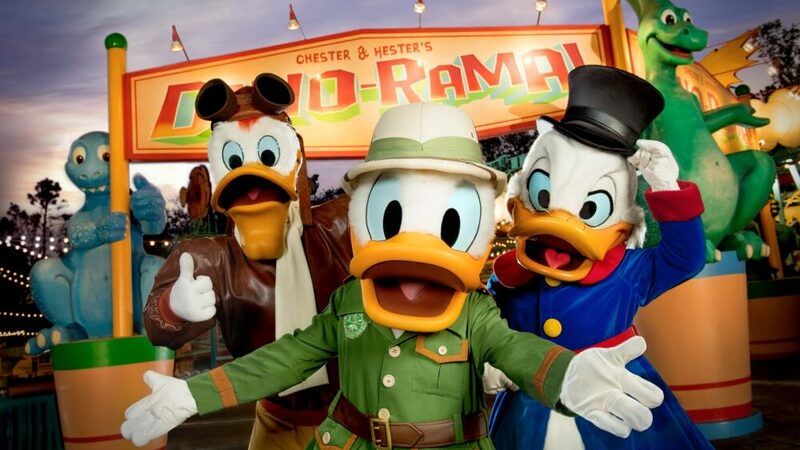 Beginning this Friday at 4 PM you can join Donald Duck and his friends inside DinoLand U.S.A. for a prehistoric party fit for the whole family. Donald’s Dino-Bash takes place on the right side of DinoLand as you enter from Discovery Island. Be sure to check the times guide for updated show times each day throughout the summer so you can join in on the fun. Character appearances are the main draw of the party including Chip ’n Dale in their new dinosaur costumes. Even Launchpad McQuack is dropping by to join in the fun. We’ll be dropping in to check out the festivities this weekend at Disney’s Animal Kingdom.